Mental illness finds a way of touching all of us, either directly and personally or through our friends and family, the people we love. It’s a confounding form of illness because it so often eludes logic. Affected people and families can feel hopeless, but there is comfort knowing that countless professionals are in the world dedicating their time, overcoming the challenges, and advocating for the individuals who need specialized care. Psychiatric-mental health nurses (PMHNs) are among them. Licensed nurses, like those who graduate from Ameritech, are eligible to be on a pathway to a rewarding career in psychiatric nursing. The field can be much different from providing care to people with physical health-related problems, but that doesn’t mean you won’t be treating patients with complex, holistic needs. 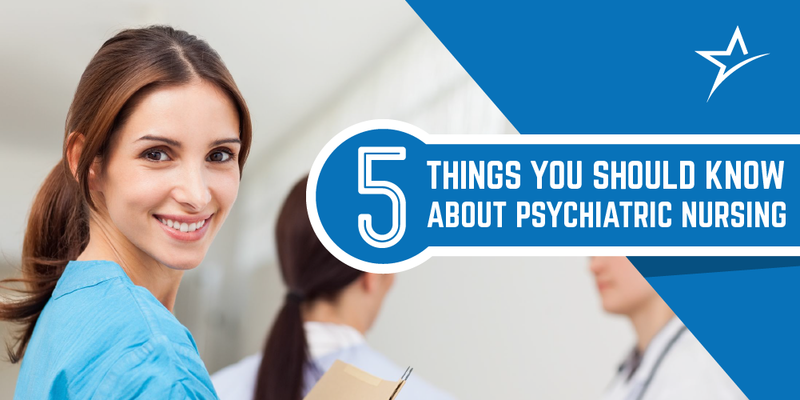 If you’re interested, or you liked your rotation on the psychiatric unit, here are five things you should know about psychiatric nursing before you pursue the specialty. Psychiatrists are physicians and can prescribe medication. They treat mental health and mood disorders, and can practice psychotherapy. Psychiatrists can diagnose underlying medical conditions because of their training as medical doctors. PMHNs are licensed nurses with a psychiatric specialty and like most nurses they do not prescribe medication. (There is one exception. An advanced practice registered nurse can in some states prescribe medication and provide more advanced treatment to patients, including psychotherapy. An advanced practice registered nurse holds a master’s degree.) PMHNs examine, assess, educate, and support patients, but do not counsel them. Psychologists hold a PhD or PsyD. They cannot prescribe medication and cannot diagnose or treat physical medical conditions. Psychologists perform psychological testing, whereas the other fields do not. Social workers have a degree in social work, usually a master’s degree. They are not required to have a doctoral level of education, and they are trained in talking with and listening to their clients. Because of their specialized education social workers are often more adept at focusing on social and societal-related factors. The hand we’re dealt in this world can vary tremendously. Singular events can have a dramatic butterfly effect, and people who live with mental illness are no different. They have stories to tell and lives to live, and as a psychiatric nurse you can help make their life better through a positive support system. By understanding that life is fragile, and learning to be open to the perspectives of other people, you’ll gain knowledge that will make you a better caregiver — and these experiences are guaranteed to stay with you for a lifetime. In any field you choose as a nurse, you’ll do amazing, rewarding work. However, psychiatric nursing is a remarkable field particularly filled with observation, self-reflection, and introspection. Your patients are dealing with difficult diagnoses, and you’ll use all your nursing skills more than you ever thought possible to help your patients succeed. You’ll calm them, help them cope, and build a therapeutic, meaningful relationship. You won’t see a night and day difference in every patient from beginning to the end, but knowing you are helping a person during a fragile time and helping them improve their quality of life, even slightly, is both rewarding for you and the patient you’re serving. There’s a delicate balance between having compassion and becoming too emotionally attached to a patient. A line must be drawn. While it’s easy to invested too much of yourself, especially with adolescent patients, you need to remember you are serving the therapeutic needs of the patient, not the other way around. You need to show compassion and humanity, but you have to focus on your objectives as a professional caregiver, which all nurses, psychiatric or otherwise, are. Letting your personal feelings cloud your judgement will only do more harm than good. One minute, your work will seem calm. The next, your whole world may feel turned upside. The job will come with unique stresses. There will be ups, there will be downs, and sometimes, even after you’ve been in the field for years, some days will feel like your first day of nursing school all over again. At Ameritech, we equip our nursing students with the solid knowledge base steeped in practice needed to excel in any practice and specialty they chose. Our RN program in Utah instills the fundamentals of general nursing, while our online RN-BSN degree completion program prepares experienced nurses for leadership and holistic care. If you have any questions, please feel free to contact us. We’d love to hear from you!